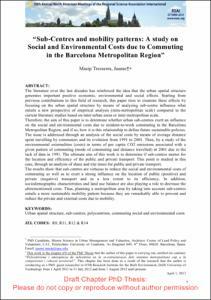 Masip, J. Sub-centres and mobility patterns: a study on social and environmental costs due to commuting in the Barcelona Metropolitan Region. A: Annual North American Meetings of the Regional Science Association International (NARSC-RSAI). "59th Annual North American Meetings of the Regional Science Association International (NARSC-RSAI)". Ottawa: 2012, p. 1-152.